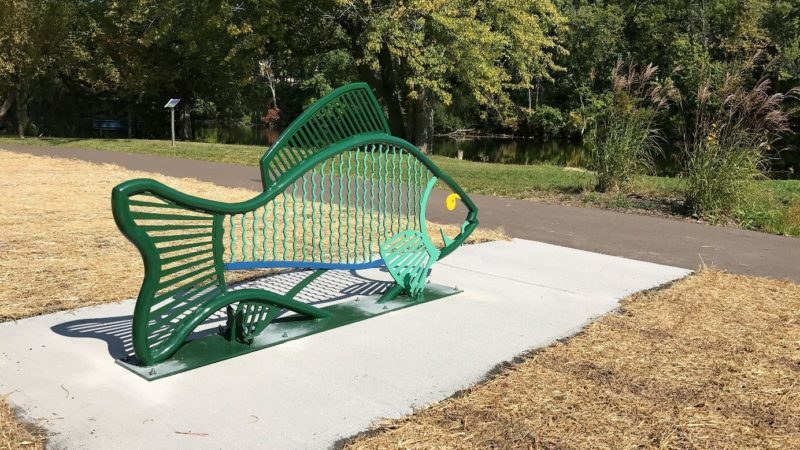 The functional and creative “fish” bike rack is a colorful site at Jaycee Park, located near the boat launch along the Riverwalk Trail. Fishing the Grand River is a popular pastime for Jaycee Park visitors, as is biking the rich trail system around Grand Ledge. The fish is a perfect addition to this fun and functional park. “Artist designed bike racks provide yet another avenue to integrate art into our daily lives while enhancing the community,” said artist and owner, Ken Thompson of Flatlanders Sculpture Supply. The fish is one of three functional bike racks designed by Flatlanders. A rollercoaster is located at Island Park and an owl is located in the Grand Ledge Area District Library parking lot.